When you choose to stay at Blue Mountain you will find it an ideal base to explore the wonderful playground of the Mt Ruapehu region with its many attractions on offer all year round. Situated on 5 acres with its resident horses it offers a fabulous rural experience whilst still being close to town. Its a 5 minute drive to the entrance road to Turoa Ski Field and 10 minutes to the township of Ohakune. The kiddies can experience a pony ride in the safety of the arena. There is a lovely big open plan kitchen,dining, lounge area perfect for entertaining and spending time together. The fireplace which will be lit for your arrival in winter provides a warm and cosy welcome and the indoor/outdoor flow is perfect for summer barbies with family and friends. The 4 bedrooms all have wall panel heating and electric blankets for your added comfort and will be freshly made up with linen and towels . The Mezzanine floor has a Sofa Bed and we also have 2x portacots and a highchair available should you require them. There are clothes drying racks for around the fire available for your use. The internal access from the garage is ideal for the colder months as it makes unpacking your gear so much easier and has plenty of storage room and a spare fridge! The Pool table and Dart board in the garage provide extra entertainment. There's even an outdoor fireplace to gather around and catch up on the days adventures and a large lawn area to play on. The addition of the mezzanine area means there's plenty of room for everyone and with its DVD, videos,toys and bean bags the kiddies will love it! The base rental rate is for up to 10 guests with an additional charge pp/pn and we can sleep up to 15 Guests . A refundable bond of $300 is required. Blue Mountain is 'An Awesome Rural Retreat! We look forward to meeting you oneday. Originally from Auckland I'm thoroughly enjoying the change in Lifestyle. The Ruapehu Region really is the Ultimate Playground. You ll see the Big Orange Carrot in town with the sign 'Ohakune Where Adventures Begin' which pretty much sums it up! We have horses on the property and love sharing this with guests.The miniatures Phoenix, Poppy and Pearl are great confidence builders and the ponies Dusty and Piper are available for kiddie pony rides, we get a real buzz at seeing peoples confidence grow- its heaps of fun as we love interacting with everyone. You'll experience FUN LAUGHTER and GREAT MEMORIES at Blue Mountain. I also have a love of Nature and run a Floral business which is a great creative outlet. I would love to meet you one day! It was a real draw card for me to purchase this property so I could have the horses grazing in the paddocks with a beautiful view of Mt Ruapehu. Its always entertaining watching them interacting with each other especially when they're playing! I fell in love with this property as its so peaceful yet still close to town and the local attractions on offer. 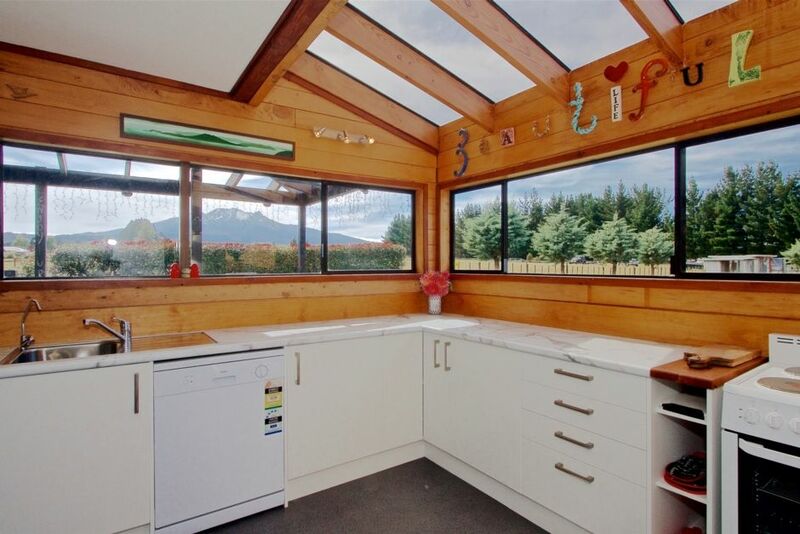 The Mountain view is Stunning especially from the kitchen and the large window upstairs. Its always different from sunrise to the beautiful sunset reflections. You'll be able to take some awesome photos of it to remind you of your holiday in Ohakune. Fabulous location and stunning views of the mountain. A great place, well proportioned for our 3 families with plenty of space for all...highly recommend! Awesome house in a beautiful spot. Perfect for families and the horse ride for the kids was a great bonus!! Blue Mountain is perfect for hosting larger family groups. Everything you need and then some. The location means all activities - walks, skiing,... are accessible. Fabulous, large, spacious and warm house, kept in pristine condition. Stocked with everything you would want. Highly recommend. Heidi was so great and ensured we were well looked after. Beautiful place to stay, spacious with lots of views, lots of room for the kids to play and adults to relax.